A survey of "Mainstreaming" (November 1999; revised February 2011) looks at key issues that have challenged educators in secondary schools since the 1970s. "Personal System of Discipline" (Spring 2000) is my personal approach to discipline in the classroom in a bullet format. In "Philosophy of Discipline and Classroom Management" (Spring 2000), I briefly present my rationale for a modified Gestalt approach. Revised February 2011. "Ideas" presents assumptions, mechanisms, parameters, pragmatics, support, tools, and propaganda about classroom management in secondary schools, in bullet format (February 2000; revised February 2011). "Use of Corporeal Punishment" (February 1999; revised February 2011) gives a biblical, religious justification for a limited use of corporeal punishment in public schools. A short overview on "Reprimand" (April 1999) as a method of "Coping With Undesirable Behavior" looks at the difference between public versus private and passive versus direct approaches. Cannonsburgh Village in Murfreesboro, Tennessee gives visitors a close-up view of artifacts and buildings from the area from the 1830s to the 1930. Gordon's School House represents a typical one-room log structure. A nice example of a one-room school house located at the 1894 Railroad Town at Stuhr Museum in Grand Island, Nebraska. Inside the school house at the 1894 Railroad Town at Stuhr Museum in Grand Island, Nebraska. I survey various approaches to history education in "Techniques for Teaching History" (Fall 2002). The three papers below were part of my teaching practicum for the Doctor of Arts degree at Middle Tennessee State University (Fall 2004). "Readings about Teaching the Past and Their Application" (Fall 2004, Revised February 2015) gives an overview of three books on pedagogy--The Practice of University History Teaching (2000), edited by Alan Booth and Paul Hyland, Historical Thinking and Other Unnatural Acts (2001), by Sam Wineburg, and Excellent in University Teaching (1975), edited by Thomas H. Buxton and Keith W. Prichard--and make a few applications for teaching a history course. "Personal Philosophy" is a brief philosophy for teaching, in bullet format. Nebraska Indian Community College in Macy, Nebraska is one of many very affordable higher education schools among Tribal Schools across the U.S. 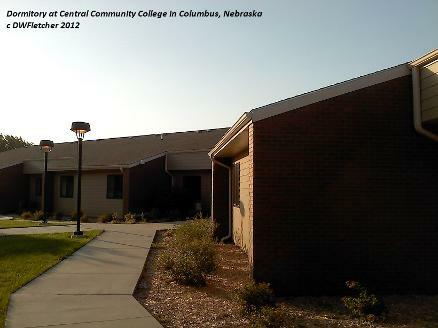 Originally established in 1969 and called Platte Junior College, the Columbus, Nebraska campus of Central Community College enrolls about 3,000 students. It was the state's first county-supported two-year college.